Type: laptop IDE hard disk adapter. 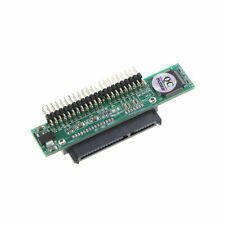 2.5 " IDE44PIN to SATA Riser Card Laptop Hard Disk Parallel Port to Serial Port Adapter Interface. Turn the hard disk into the current mainstream SATA interface for easy use on the new desktop board. Trending at $5.57eBay determines this price through a machine learned model of the product's sale prices within the last 90 days. Convert 7 15pin SATA into 2.5" IDE 44pin device. Features: Female to Male, SATA to IDE, Hard Drive Adapter. Type: SATA to IDE Adapter Card. 1 x SATA to IDE Adapter Card. No drive need, plug and play. Support hot plug, without any driver can use. We want to make sure you are happy with our item. Goods without RMA number will NOT be accepted. Support ATA 66/100/133. We'd like to settle any problem in a friendly manner. 1 x 2.5" Male IDE to 7 15 pin Female SATA Adapter. Convert SATA Hard Drives to 44-pin IDE interface. 44pin IDE connector powers the drive. No driver required, plug and play. Miniature board design. Adopting international high quality JM20330 chip, the performance is stable. Use this conversion card to use the SATA hard drive on the motherboard with IDE interface. 1PC X SATA Female to 2.5" IDE Male Adapter. 1 x 2.5" Male IDE to 7 15 pin Female SATA Adapter. Convert SATA Hard Drives to 44-pin IDE interface. 44pin IDE connector powers the drive. SATA Female to 2.5" IDE Male Adapter. Product list: 1 riser card. 5, support hot swap, no need to use any driver. We want to make sure you are happy with our item. Goods without RMA number will NOT be accepted. Use for converting 2.5" IDE Laptop Hard Drives to SATA interface. 10 x 7 15 pin SATA to IDE Adapter. Maybe you could not put it into your notebook! United Kingdom. Convert SATA Hard Drives to 44-pin IDE interface. 44pin IDE connector powers the drive. No driver required, plug and play. Size:approx 69mmX14mmX17mm. The product only support mSATA Mini PCIE SSD, it dose not support SATA Mini PCIE SSD and PATA Mini PCIE SSD. You can connect it to laptop or desktop, without any driver. One IDE 44pin female connector to connect to IDE 44pin male device. - 2.5" IDE hard drive can be detected and used as a regular SATA hard drive. - Converts all IDE 43pin type devices HDD/CD-ROM/CD-RW/DVD-ROM/DVD-RAM/DVD-RW into SATA device. SFF-8482 SAS 29 Pin to Dual 7 Pin SATA Hard Disk Drive HDD Raid Adapter PCBA SAS. Black IEC C14 Male to 3 Three C13 Female Y Type Splitter Extension Cable 20cm. Supports IDE 66/100/133MB/s. 44 Pin IDE connector powers the Drive no other cables or adapters are needed. Connect the SATA of the riser card to the SATA port of the hard disk and transfer it out of the IDE interface without driver. Desktop and notebook SATA to IDE, serial to IDE, SATA hard drive to IDE. Serial SATA To IDE bridge board, Output interface 44 pin IDE. 2.5" SATA Hard Drive to IDE 44 Pin Adapter for Laptop Drives. 44 Pin IDE connector powers the Drive no other cables or adapters are needed. Trending at $11.19eBay determines this price through a machine learned model of the product's sale prices within the last 90 days. One IDE 44pin female connector to connect to IDE 44pin male device. 2.5" IDE hard drive can be detected and used as a regular SATA hard drive. Converts all IDE 43pin type devices HDD/CD-ROM/CD-RW/DVD-ROM/DVD-RAM/DVD-RW into SATA device. This is a horizontal SATA to IDE converter. 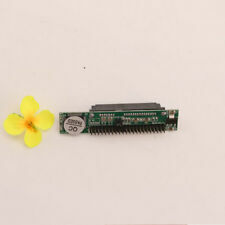 44Pin IDE connector is suitable for 2.5" laptop SATA hard disk drive. Allows to connect one SATA hard drive to a 44Pin IDE connector. 1 Port Converter. IDE to SATA Adapter. The 44-Pin IDE 2.5" HDD to SATA Adapter can allow you use your laptop 2.5" IDE hard disk as SATA disk. You can use your 2.5" IDE hard disk in the laptop or desktop which have SATA connector. SATA hard drive transfer IDE interface adapter card. 6, support hot swap, no need to use any driver. 1x adapter. 4, in line with Serial ATA 1.0 specifications, the maximum transmission rate of 150MB / s.
Allows to connect a 7 15Pin SATA hard drive to a 44Pin IDE connector. One IDE 44P male connector for connecting to 44P IDE connector. SATA hard drive can be detected and used as a standard 2.5" IDE hard drive. We want to make sure you are happy with our item. Goods without RMA number will NOT be accepted. Support ATA 66/100/133. Support hot plug, without any driver can use. We'd like to settle any problem in a friendly manner. 7 15PIN SATA hard disk to IDE interface. 1x Hard Drive Adapter Card. - Support ATA 66/100/133. • This SATA to IDE Adapter is the perfect solution for adding SATA drives to motherboards lacking available SATA connectivity - SATA data and power connectors. • One end of the IDE Converter is 44 Pin IDE Male connector, the other end is 7 15 pin SATA Female connector.